Most of Bhagavan Sri Ramana’s works were composed in response to requests of devotees. While at the Virupaksha cave on Arunachala, devotees like Palaniswami and Ayyaswami requested Sri Bhagvan to compose a song for them to sing whist begging for alms in town. This they felt would help the townsfolk identify them as his devotees. But there was no response from Sri Bhagavan. Subsequwntly, however, when he was walking round the Hill one day, with devotees following him, the litany, Sri Arunachala Aksharamanamalai, being divinely inspired, welled forth from him spontaneously. Before the pradakshina (circumambulation) ended, Sri Bhagavan had strung together a garland of 108 verses for his beloved Arunachala. As he wrote the poem in a state of ecstatic devotion, tears streamed down his face and his voice was choked. In later years year Sri Bhagavan used to remark jocularly that this hymn had them for many years. A few minutes before his Brahma Nirvana on 14 April 1950, devotees began to spontaneously chant this hymn in front of the room where he lay. Tears tricked down his cheeks as the crowds joined in chorus repeating the refrain, Arunchala Siva, Arunachala Siva, Arunchala. Aksharamanamalai is the most well known among the hymns composed by Maharshi. Arthur Osborne says, “it tells in glowing symbolism of the love and union between the human soul and God and is among of the most profound and moving poems in any language. The Commentary of Dr T.M.P. 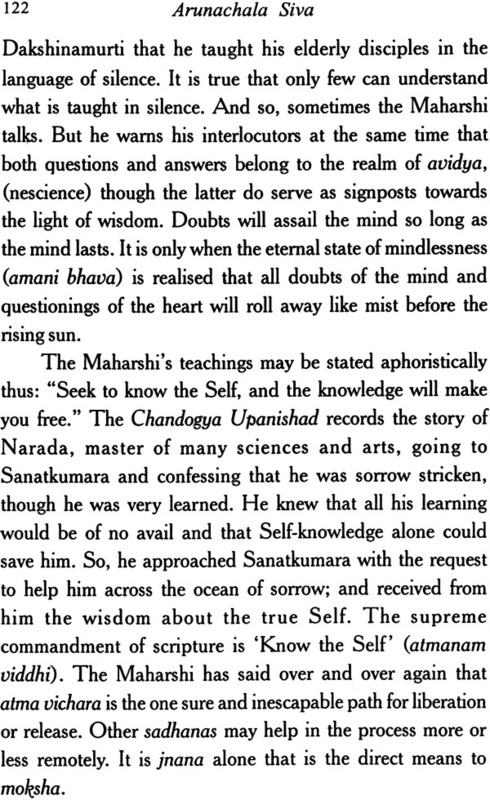 Mahadevan is of immense help in understating the texts of Aksharamanamalai and Arunchala Pancharatnam (Five Verses). The first article that was written by me on Bhagavan Sri Ramana was at the instance of the late Mr. Arthur Osborne who was then on the editorial staff of the Indian Express Magazine. Section. 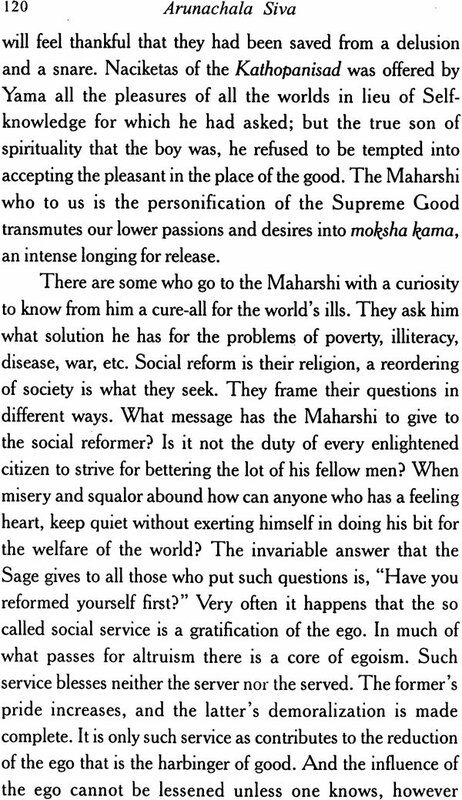 It was published in that paper under the title Sri Ramana, Sage of Arunachala, on Sunday 9th April 1950, five before the passing away of the Master (14th April 1950). During the subsequent years, Sri Ramanasramam has brought out my English translations of self enquiry and His philosophy of existence. This contains a translation with a commentary on the forty verses on existence and of the significance of the sage’s life and teaching. 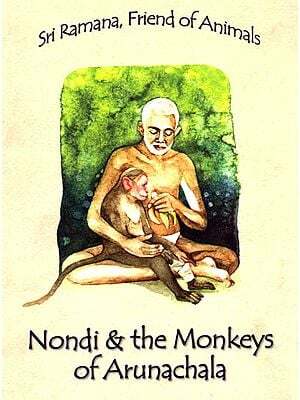 In 1977, Messrs George Allen and Unwin, London, published my book Ramana Maharshi the sage of Arunachala which consists of three parts devoted respectively, to the life of Bhagavan Sri Ramana, his work and his teaching. 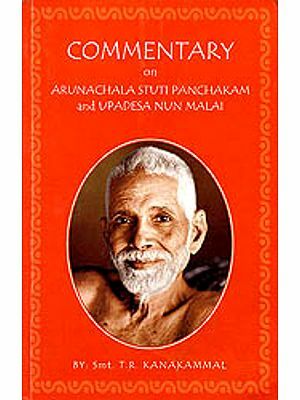 The present volume Arunachala Siva, gives to the English Knowing readers, two of the hymns to Arunachala composed by the sage: the Arunachala Aksharmanamalai (Bridel Garland of Letters for Arunachala) and the Arunachal Pancharatnam (Five Verse-gems on Arunachala). The Sunday express article is reproduced as an appendix. Most of Bhagavan Sri Ramana’s compositions were written in answer to a query put, a doubt raised, or a request made by some devotee or other. Some of them came out of him as the expression of an inner urge. He was no author in the ordinary sense of the term. He truth he saw he revealed to those who wanted to have a glimpse of it. When Sri Ramana was staying at the Virupaksha cave on the Arunachala Hill, the devotees who were then could sing while going out for begging alms. But there was no response then. Subsequently, however , when he was walking round the sacred Hill one day, with devotees following him, the litany, Arunachala Aksharamanamalai, being divinely inspired, welled forth from him spontaneously. Referring to the manner of this composition, he himself later on said that it was not the result it came out of his heart unexpectedly and spontaneously. Of the hymns on Arunachala composed by Sri Ramana, the Arunachala Akharmanamalai was the earliest. The very name Arunachala had fascinated Sri Ramana Right from his childhood. It was in search of Arunchala that he left behind; he had stated that he was going in quest of his father, and that no one need go after him. After arriving at Tiruvannamalai, he stayed there till end of his earthly life. To him Arunachala was no mere hill. It is the visible symbol of the Absolute spirit. His found no contradiction between his Advaita experience and devotion to Arunachala and devotion to Arunchala. 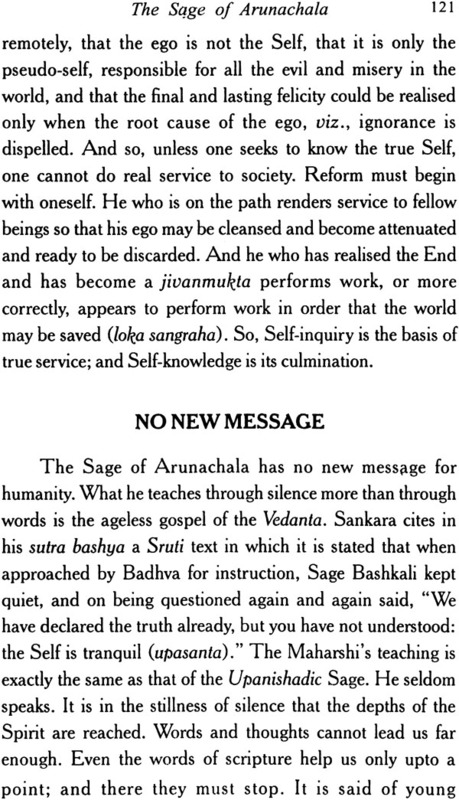 In fact, there can be no opposition between jnana and bhakti at the highest level. That view which holds that there is no place in Advaita for either God or devotion is clearly mistaken. There is an old Sanskrit verse which says that it is by the grace of God that even the inclination towards Advaita comes to a few. What is called God in the language of religion mysticism is the same as the Absolute of Advaita. In Bridal mysticism, the devotees consider himself to be the bride of God. He employs the intimate language of love in conversing with his Lord. All the processes connected with carnal love are observed to take place between the devotee soul and the bridegroom, except the carnality. The devotee soul and the bridegroom, except the carnality. The devotee pines for, cringes, cajoles, chides and quarrels with the beloved. There are courtship, union, separation, and reunion. In that phase mystic which is known as bridal mysticism, the mystic revels in the love-play with the Divine. 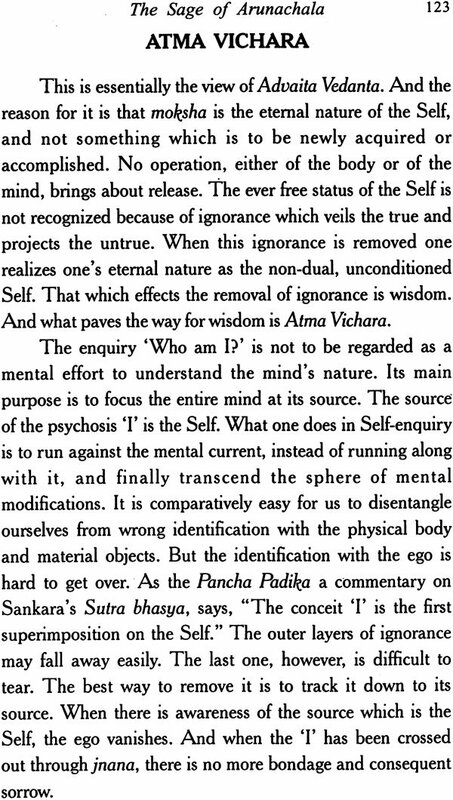 The culmination of this Sadhana, however, is the Realisation of non-duality. Love is never satisfied so long as the dualistic consciousness lasts. Where twoness is, there is no true love. Love is oneness; ananda is Advaita; the Atman is rasa. In Sri Raman’s love litany we have this clearly taught. 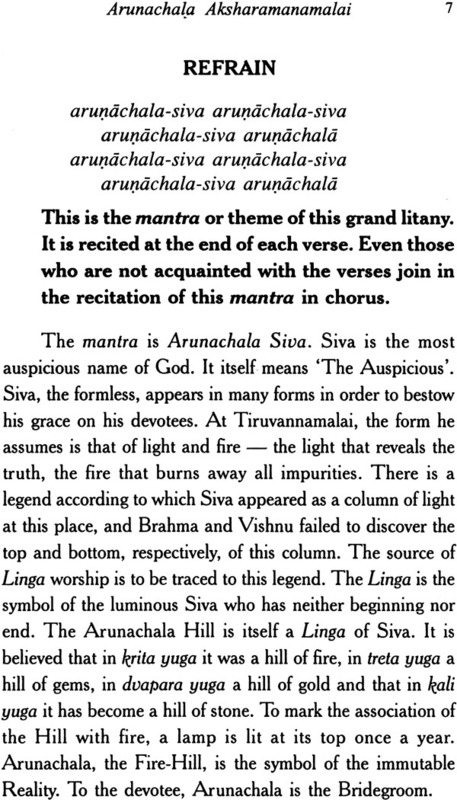 Even in the first verse of the hymn he speaks of the ‘I am Arunachala experience. When love matures and realises itself this is nothing but Arunachala. 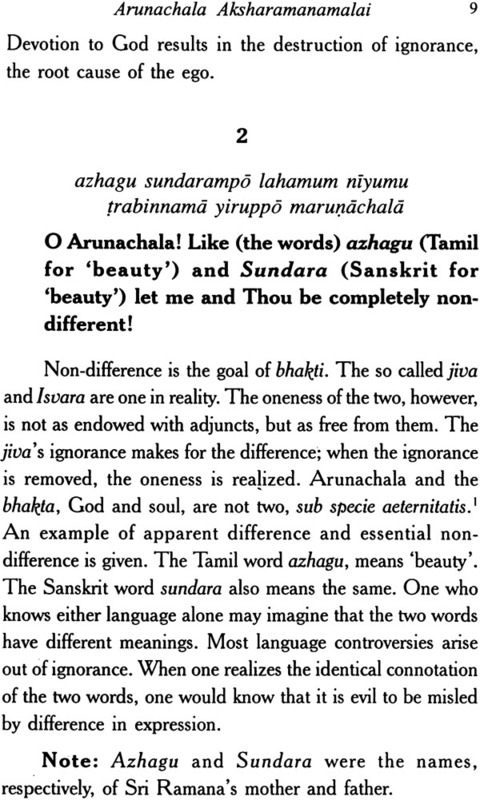 Arunachala is all; all is Arunchala. This is the plenary experience which is Advaita. The title of this lyric poem, Arunchala Aksharamanamalai mens the bridal garland of letter for Arunachala. Mana Malai is the wedding garland which symoblies the union of the bride with the bridegroom. It also means sweet scented garland. The poem is called Aksharamanamalai because the initial letters of the verses of the hymn are in the alphabetical order. Aksharamanamalai may also mean the garland that serves as the insignia of marriage with the undecaying lord. The phrase contains the name of Bhagavan Sri Ramana too Akshramana. It is significant that the hymn is composed of 108 versus a number that is supremely sacred.